A little bit past Howell's Bridge the highway, railway, and river all split in different directions. 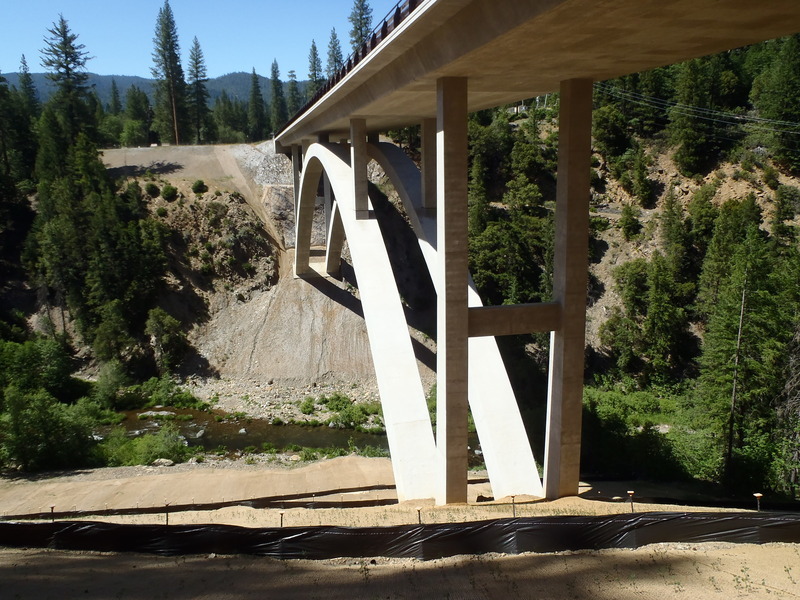 State Route 70 continues along the North Fork but State Route 89 splits off, goes south, and eventually takes us to the Spanish Creek Bridge. After a month of looking at truss bridges it's a relief to enjoy the simple lines of an arch bridge. I was planning to photograph the old Spanish Creek Bridge (a deck truss that was built in 1932 on tall steel towers) but it had been removed after the new arch bridge was completed in 2012. 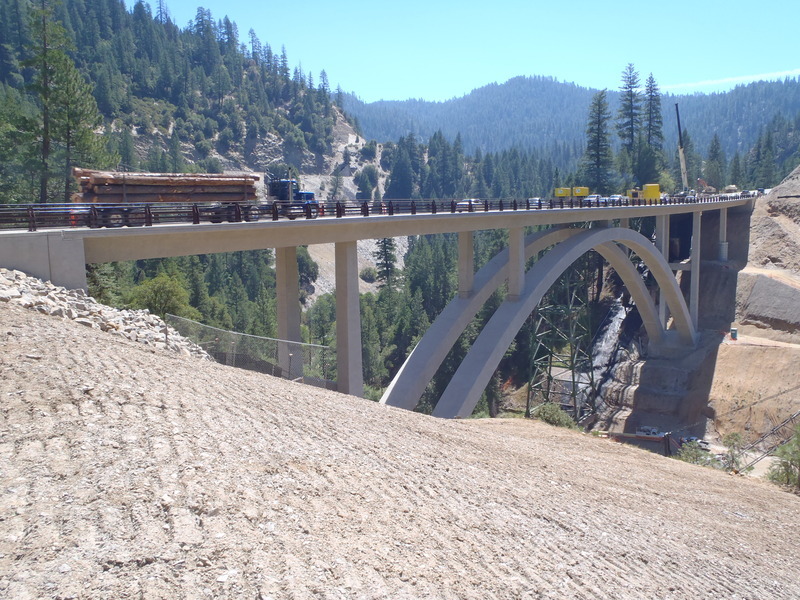 You can see some views of the old bridge in the construction photos below (courtesy of the contractor, CC Meyers). These photos show how the long arch was constructed. The first thing they had to do was pour the enormous thrust blocks on each side on the canyon. They rigged hundreds of tubes through each thrust block to pump cool river water through it and keep the mass concrete from cracking. 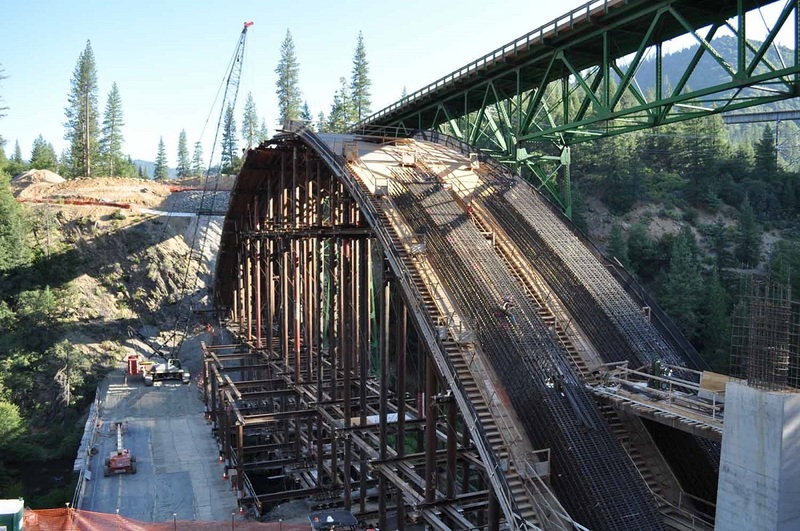 Then the arch falsework was constructed and the formwork was placed on top. The arch reinforcement was put into position and the concrete for the arch was poured in segments. The concrete must have been pretty stiff to be poured and formed on the sloping formwork! 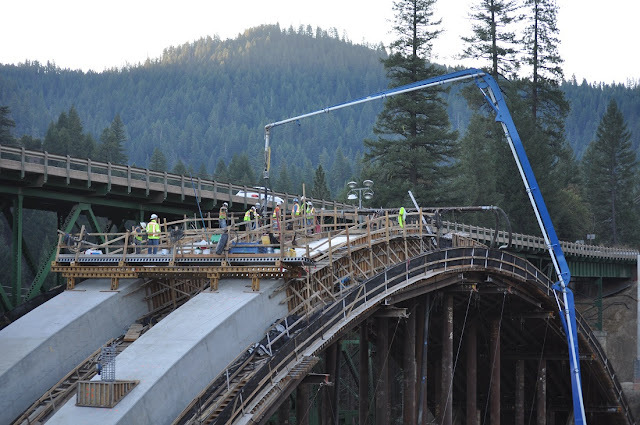 Once the two arch ribs were cured, strand jacks were placed on top and lowered the falsework and formwork to the ground. 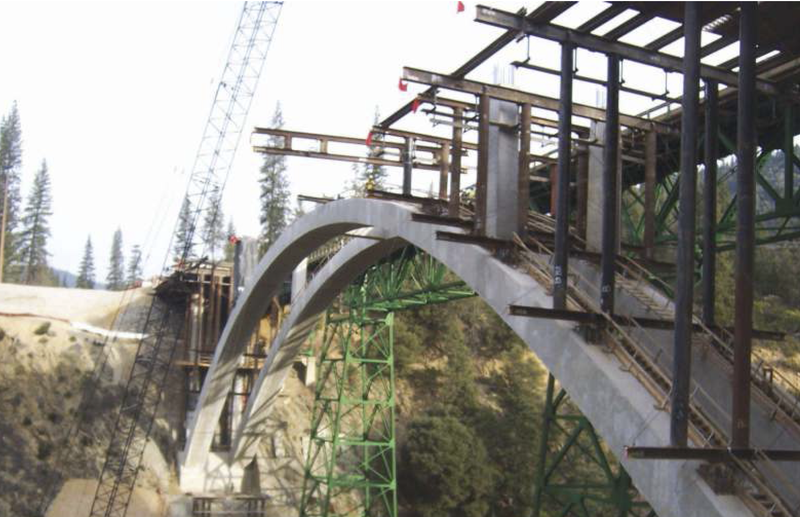 Spandrel columns were poured on top of the arches and falsework and formwork was set on the arches to carry the reinforcement and concrete for the deck. I heard that the contractors were excited to be on such an interesting bridge, the work progressed smoothly, and the project won several partnering awards. That's a pleasant change from some projects where the contractor is always looking for a way to make money through litigation. Spanish Creek is a seven span bridge with some tall and some very short columns. Since the bridge is in a seismic area the columns had to be designed to move together during an earthquake. If some columns were stiffer they would carry most of the inertia load and break. To prevent this, isolation casings were built around the columns next to the abutments to hold back the surrounding soil (see far columns in photo below). The supports at the top of the arch ribs are pedestals with bearing pads that allow the deck to move during an earthquake. 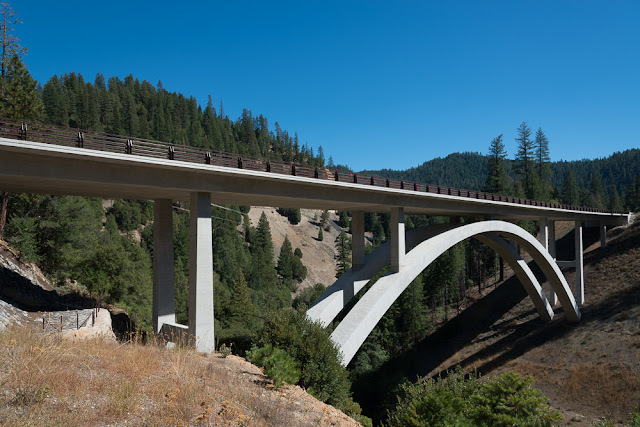 This bridge (as well as the previously studied Devil's Slide and Confusion Hill Bridges) was designed by Caltrans engineer Kevin Harper who has become a great designer of long span arch bridges. Plumas County, California Bridges: State Route 89 Bridge across Spanish Creek by Mark Yashinsky is licensed under a Creative Commons Attribution-NonCommercial-NoDerivatives 4.0 International License. This is State Route 70. The Structures Project Engineer and designer of this bridge was Eric Watson. Kevin Harper was the checker. Thanks for setting me straight! Comments and corrections are always appreciated.